Carbon monox ide (CO) is a colorless, odorless, and tasteless gas that is slightly lighter than air, produced when fuel burns without enough air for complete combustion. 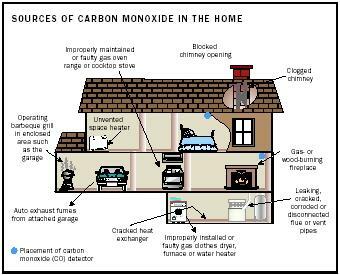 The most common symptoms of carbon monoxide poisoning may resemble other types of poisonings and infections, including symptoms such as, headache, dizziness, nausea, coughing, irregular breathing, paleness and cherry red lips and ears. If symptoms are noticed, it is advised that you immediately get outside into fresh air. Carbon monoxide levels cannot be accessed through a physical exam and laboratory testing. Later, have appliances checked carefully by a certified home inspector. Carbon monoxide detectors should be placed in appropriate locations throughout the home. When placing your CO detectors, select areas near bedrooms, in rooms over or near a garage, in the basement or other isolated area, and in rooms with space heaters, if applicable. Check with the manufacturer to see how often your CO detectors should be replaced. Make sure it is installed according to manufacturers specifications, so it will work properly. Be sure all gas home appliances have proper ventilation. Have your gas chimney and flue cleaned once per year. Don’t rely just on carbon monoxide detectors. Make sure you maintain and servicing gas appliances, furnaces and chimneys. When lighting a gas heater, be sure burner flames are blue and not orange. Never use a gas range in place of a space heater. Never run an automobile or gasoline engine in an enclosed space without proper ventilation. Never use a BBQ grill or turkey fryer indoors. Have a “CHI” certified home inspector to check your appliance system(s) each year.